Now, I love gift wrapping and I don't think it is given as much attention as it probably should. Wrapping my presents is a massive event on my lead up to Christmas. 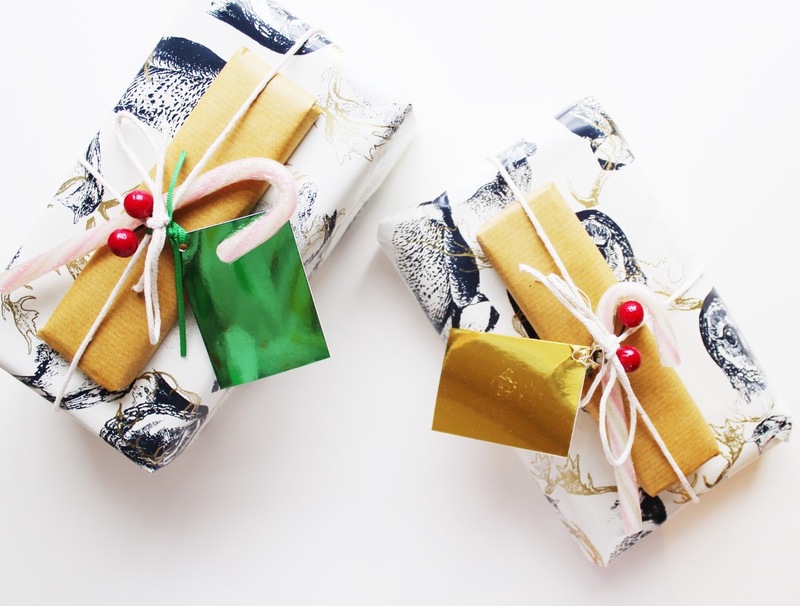 So, in this post I am going to share my tips and tricks for the most perfectly wrapped gifts. Choose a theme and stick with it. Decide whether you are going to go traditional or a bit more out there. But whatever you decide try and keep it consistent throughout. Last year I went with a sort of Victorian style theme with the classic red and gold, deer, twine and red berries. My paper, gift tags and berries are all from Paperchase. Also if you can afford it, buy good quality paper, materials etc. It makes all the difference when it comes to wrapping and presentation. Although, I was a little bit thrifty last year and used just some plain brown packaging paper to break up the cream, and some twine which I had lying around the house. If you are stuck for a theme, Pinterest is great for inspiration. I absolutely adore the idea of sprigs of fresh fir intertwined with ribbon.. maybe that can be something for this year. Once you have chosen your theme, assess your gifts. For example; bottles of wine/spirits should ideally be presented in a bottle bag. It is definitely no fun trying to wrap one of those babies. Also anything circular, hexagonal, octagonal, or even nonagonal (and yes, that's a shape!) you might be best just wrapping it in something a bit more forgiving, like tissue paper. Once I have wrapped my gifts I usually like to put them in a gift bag. Not only is this convenient if you have to travel with them, but also in identifying whose belongs to whom. Make an occasion of it. Every year I take a whole morning out and dedicate it to my gift wrapping. I try and do this soon after I have finished all my present buying as I have a very inquisitive (darn nosey) boyfriend who can sniff out unwrapped presents within a 100 metre radius, so it is important to get them wrapped sharpish. Anyway, I just love seeing what I have bought people come together, and I love making it look extra special for when they open it on the day itself. I make sure I am wearing my 'festive best' i.e. my Christmas pajamas. I then make myself a hot drink, coffee or an indulgent hot chocolate, with a mince pie.. or two, and then put on a comedic Christmas special. I love it, it is proper down time and really gets me in the spirit. Give yourself lots of space. And most importantly make sure it is a clean work area. Something I have learnt from having a cat; fur gets everywhere! Unless you want the person receiving your gift to also receive a tuft of fluff courtesy of Felix you best get the cleaning wipes out. Be prepared with the sellotape (and all the other necessary tools, obviously). There has been too many occasions where I have been sat there with my big toe holding a particularly difficult join together, while I wrestle mercilessly with the tape. But no more! I precut my tape ready for when I need it. If you are fancy you will have one of those dispenser things. Remember to only cut what you need. There is nothing more unattractive than lots of excess paper. It is also harder to wrap as you don't get those sharp edges. Give yourself an easy job and measure up how much you need. 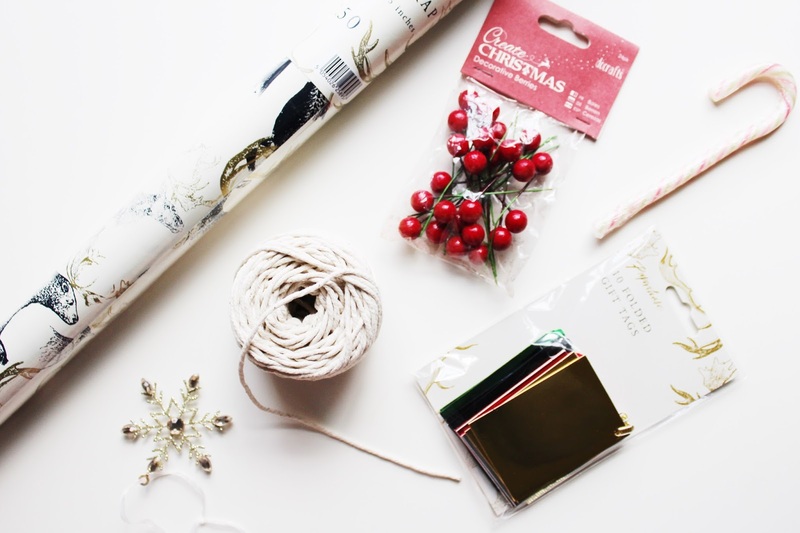 If you have chosen particularly pricey paper, or you have a lot of presents to wrap, you don't want to be wasting any! Remove all the PRICE TAGS - Oh. My. Word. There is nothing worse than opening a present and seeing how much it cost. I get so embarrassed and try to pretend I haven't seen it. I am even getting the sweats just thinking about it now. Always have a good look around your gifts, because sometimes retailers are sneaky and put tags in places you wouldn't have even thought to look. Sly. And don't forget your gift receipt. I always like to wrap these up with the present. It saves the awkwardness of being asked for it later.